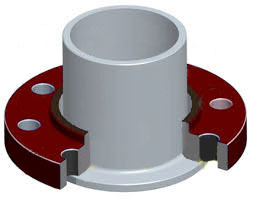 A Lap Joint Flange is a two piece device that is much like a weld-neck flange but also like a loose slip-on flange. One piece is a sleeve called a ‘Stub-end” and is shaped like a short piece of pipe with a weld bevel on one end and a narrow shoulder on the other end called the hub. The hub is the same outside diameter as the raised face (gasket contact surface) of a weld neck flange. The thickness of the hub is normally about ¼” to 3/8″. The back face of the hub has a rounded transition (or inside fillet) that joins the hub to the sleeve.